Direct Rotary Drilling is the most common drilling method in both the oil and geothermal industries. Direct mud rotary drilling offers a number of advantages. Direct Rotary Drilling is the most common drilling method in both the oil and geothermal industries. Direct mud rotary drilling offers a number of advantages. It is a very fast and efficient means of drilling and is adaptable to a wide variety of geological conditions. In many cases direct rotary drilling can be the best alternative, especially for deep wells, directional wells or wells completed into well-lithified rocks. 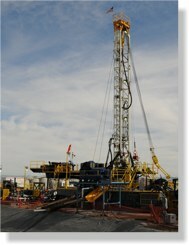 In keeping with Barbour's current core values of meeting customer's demands, Barbour utilizes mobile, yet powerful, drilling rigs that offer advantages of a small footprint for tighter working conditions yet stout enough to handle drilling conditions that would normally utilize larger rigs. Our late model rigs are square set derricks, double drum table drive units, (which can be converted to top drive units), that come with portable mud pits using double shakers and a full manifold of de-sanders that provide clean, low solids drilling mud. Make out / break-out tongs and pipe handling systems also add to speed, safety and efficiency of operations. Triplex tier 3 pumps are also part of our late model equipment package that Barbour's customers can count on, which is fully compliant with current state and industry AQMD regulations. Barbour's direct rotary rigs are available for vertical or directional operations for both oil and geothermal drilling projects. Our dedication to safety and exceptional crews provide additional advantages to our clients for a successful outcome to short or long term drilling programs.